Perhaps, although provided the food is appropriate and offered in moderation the it is unlikely to cause many problems. Feeding wildlife is a common practice all over the world, with many people seeing it as a chance to help their local wildlife out during tough periods when food is hard to find. Others view food is an invaluable tool in generating ‘close encounters’ with wildlife; without it many people would never see some species and many of the photos adorning glossy wildlife magazines would never have been taken. There are, however, some compelling arguments against feeding wildlife, including building dependencies, habituating animals to humans, increased aggression of fed animals, high mortality on the roads, substantial (unsustainable) increases in population numbers, digestive problems and the attraction of predators. So serious are some of these issues that it is illegal to feed wildlife in some countries. In terms of British mammals, there is currently no evidence that feeding forms dependence, but it has been shown to increase population size and increase disturbance. Consideration should be given to what food is provided and how it is offered. Before we look at motivations and impacts behind the feeding of wildlife, we should quickly define what we mean by the term “supplemental feeding”. Supplemental feeding is quite simply the deliberate feeding of wildlife. 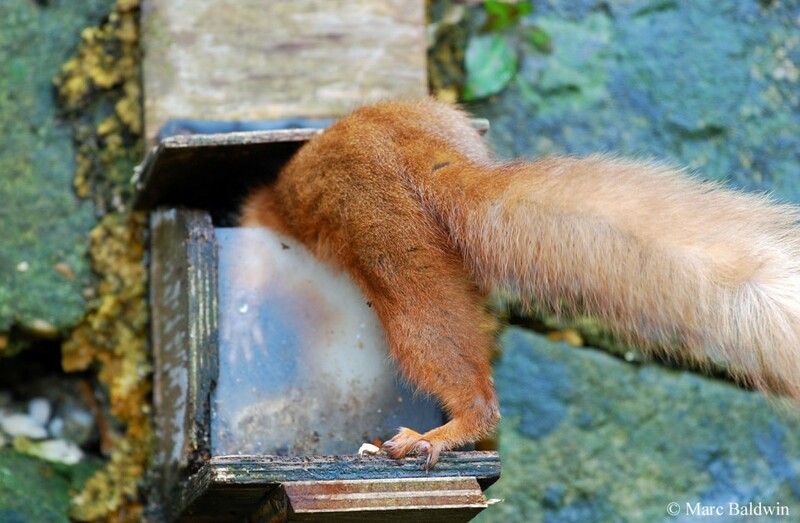 Whether you put up a bird feeder in your garden, leave a saucer of pet food out for your local hedgehog or fox, or give your sandwich to a squirrel in the park, all are considered supplemental feeding. There is no doubt that the practice of feeding wildlife is widespread and big business – in 2015, the Pet Food Manufacturer’s Association estimated that Britain’s wild bird market (i.e. businesses selling bird food, feeders, boxes, etc.) was worth £210 million. The reason why people are willing to spend so much money on providing food for wildlife can be broadly spilt into two groups: helping animals out; and prolonging interaction/viewing time or likelihood. We’ll consider each in turn. Most people are aware that humans are having a significant negative impact on the environment. The term ‘habitat destruction’ refers to any process that results in one habitat type being removed and replaced with another, but can sometimes extend to include overexploitation or pollution of a habitat. BirdLife International rank the destruction of habitat as the most serious pressure on the world’s bird species – some 86% of the globally threatened bird species are in decline because of habitat destruction. Habitat destruction combined with other factors, such as climate change, has been implicated in the decline of species across the globe. Closer to home, here in the UK, we have seen a significant decline in the numbers and distribution of once common farmland and woodland bird species through changes to farming and woodland management practices, as well as an increased need for housing. None of the aforementioned has gone unnoticed by the newsmedia and conservation issues are making the headlines on almost a daily basis, with the urge for people to ‘go green’; to try and reduce their impact on the environment wherever possible. Consequently, it is generally considered that many people feed wildlife, birds in particular, because they believe that the animals need this food, their natural food having been removed or reduced by human activity. Indeed, the bird feeding industry is geared towards this exact presumption, selling different types of food at different times of the year (e.g. high fat during autumn and winter and high protein during summer) and to attract specific bird species. Wildlife watching is often painfully difficult. Most wild animals, and British mammals in particular, are either nocturnal or have a healthy fear of humans; in the majority of cases, both. So, if you want to get that fox, or those badgers to stay that little bit longer in your garden, perhaps long enough to get a photo, what do you do? You put out food and, if you’ve done your homework, you probably scatter it around the lawn to prevent the animal in question from just picking it up and taking it away to eat it in a ‘safer’ location. Similarly, some of the most spectacular images of wildlife have been taken when the animal has been lured to the photographer on the promise of something to eat. Educational tours use the same philosophy to ‘guarantee’ close encounters with their chosen subjects; as most badger watchers have found, brock spends very little time milling around the sett of an evening, often emerging and taking a few sniffs before heading straight out to feeding grounds – a couple of handfuls of nuts sprinkled around the sett helps keep the badgers about to permit observation. Holidaymakers and film crews are drawn to some locations in the tropics and sub-tropics on the promise of being in the water with sharks – again, a guide with a block or box of fish help to ensure that the animals turn up. The late opera singer Luciano Pavarotti once said: “One of the very nicest things about life is the way we must regularly stop whatever it is we are doing and devote our attention to eating.” This sums up nicely the role of food in the lives of animals, from the smallest of invertebrates to humans. Food is crucial to survival; without it we cannot survive and for this reason it is called a ‘limiting factor’. Limiting factor is an ecological term meaning anything that an animal needs to survive – food, water, shelter, oxygen, etc. Different species have different limiting factors and some are more crucial than others—typically, we can survive for up to about three weeks without food, but only about three days without water and three minutes without oxygen—but, overall these factors can be used to explain changes in a population. Hand in hand with limiting factors goes the maximum number of individuals of a given species that an area of land can support; known as the carrying capacity. A population will increase in size until it reaches the habitat’s carrying capacity, at which point one or more limiting factors will step in to prevent it getting any higher. Let’s take an example. You got to the supermarket every week for your grocery shopping; it’s always been well stocked and quiet. Suddenly, a new housing estate built nearby leads to an influx of other people, all trying to do their shopping. The supermarket only had a limited amount of food and when the last melon, let’s say, is gone then that’s it – they may order some more but it’s going to take a couple of days for them to arrive, just like wild food takes time to replenish. So, you need to get one of those melons, but everyone else in the shop also has a desire for fruit salad, what do you do? Well, you try and get to the fruit first: maybe you get to the shop earlier, or barge your way through knocking pensioners and small children out of your way – this is known as competition (you and your neighbours are striving for the same thing and, invariably, some will succeed at the expense of others). What happens if you don’t get to the melons in time, or can’t wrestle one away from another shopper? You either need to go somewhere else (another shop) and look or you must change your plan and chose another fruit, assuming there are still some left. This may be an inconvenience to you, but to a wild animal not being able to find sufficient food can spell disaster, because, without it, death is sure to follow and the population will decrease in size until there are fewer animals than food items (more melons than shoppers, if you will); at this point, more animals can survive in the area, more babies get the food they need and grow to adulthood, and the population rises until the shortage happens all over again. Limiting factors and carrying capacities combine to form a part of what ecologists call ‘density dependant’ population control. Where am I going with this? Well, two of the main arguments against feeding wildlife are that it leads to artificially high population sizes that cannot be sustained if the supplementary food is removed, and that supplemental feeding may lead to the animals becoming dependent on the handouts. The idea that provision of food by humans leads to greater numbers of animals and could lead to them becoming dependent on our handouts go hand in hand. To return to our melon example; if some kind-hearted person drives to the supermarket in the next town and buys ten additional melons and brings them back to the shop, that represents ten more people who will get one, and ten people who will survive another day that may not have without this intervention. What about tomorrow? If there aren’t an additional ten melons tomorrow, or the day after, how will you feed yourself and your family? Hence, wildlife biologists say that if you’re going to put out food, you need to do so consistently. This statement seems logical and it is easy to imagine how an animal fed entirely on ‘human food’ may lose the ability to hunt, but I believe it underestimates most animals, particularly mammals. We only have to look at our pet cats to see this is not necessarily the case. Most domestic cats are provided with all the food that they require such that they have no requirement to hunt; yet most still can and do. Indeed, cats are still among the most efficient mammalian predators on the planet, even after some 4,000 years of domestication. We know that hunting is part instinct and part practice for animals, but there are currently no data that I’m aware of to suggest scavenging or utilising supplemental food results in an animal being a less efficient hunter. Indeed, it is an interesting juxtaposition to hear someone argue that feeding foxes makes them dependent because they lose their ability to hunt and, shortly afterwards, accuse them of being cat-killers. Foxes, badgers, hedgehogs, squirrels and many other common garden animals will gladly accept our handouts and some evidence suggests that they may come to expect it. I have noticed that foxes will turn up to a feeding station spot on time (if food is left out at a given time each night) and have observed them to show up for several days even after food provision has stopped, as if expecting the food to return. After a few nights of not getting any titbits, the fox fails to turn up (or, more likely turns up later if my garden happens to be on his beat). Similarly, tracking studies on foxes in Bristol has shown them to visit the gardens where they know that they’re going to get fed first; in contrast, hedgehogs seem to forage as normal, whether food is put out or not. There is little empirical support for the “dependency theory” in the literature. Studies on foxes in urban areas of Bristol and Zurich have demonstrated that despite the food put out by home owners, birds and small mammals still typically account for at least 20% of the diet. Nonetheless, scavenge (intentional provision or otherwise) may represent an important component of the diet and, in Zurich, more than 60% of stomach contents were scavenged meat and cultivated crops, particularly fruit. In the UK, the diet of foxes foraging in urban areas can consist of between 30% and 65% scavenged food – studies in London suggest that the proportion of scavenge can be related to the where in the city the animal forages, with inner city foxes eating fewer earthworms and more scavenge than those foraging at the edge of the city. Nonetheless, the science suggests that even urbanites still include wild prey in their diet. While many species show no sign of dependency on human provisions, there are some tragic examples of some that do. When we think of an animal being dependent on us for food, it is easy to think that our provisions mean that they somehow lose their ability to search for their own food (as per Mark Oram’s comments). While this may be a problem for very young animals raised solely by humans, and even that’s speculative as we have seen, it seems unlikely to be the case for wild adults. Importantly, the ability to forage is only of benefit if there is food to find in the first place. If the food just isn’t there when our provision has been removed, or the animal’s digestive physiology doesn’t permit a rapid switching of diet, a true dependency can arise. A couple of good examples come from the USA. During the winter of 1996 in Montana, the practice of feeding local deer made the news. At one feeding station a local woman explained that they could no longer afford to feed the deer, telling a wildlife biologist “Every day more and more [deer] come to the feeders, but we’re already spending $100 [about £50 or €65] a month. Isn’t there something you can do?” The answer was no. Deer were being drawn in from miles around and they weren’t used to the diet of corn and hay the feeders were supplying. Deer are ruminants and rely on microorganisms (bacteria and protozoa) in their stomachs to breakdown the plant material they consume. (Mammals lack cellulase enzymes and so cannot digest cellulose themselves.) The downside is that different microorganisms are needed to tackle different plant material; a diet of new shoots and other spring growth will lead the deer to have a different stomach microbes to a diet of bark and woody shrubs. Moreover, time is needed for the microorganisms to develop in the gut. It is for this reason that deer cannot switch foods quickly and why carcasses can be found having starved to death with full stomachs. Another example comes from Monterey in California during 1988, when vendors were selling fish to tourists, so they could feed the pelicans and sea lions. Unfortunately, this superabundance of food meant that the pelicans didn’t migrate and during the winter when the tourists had gone there wasn’t enough food to support them all. Many birds starved or died from Erysipelotrix infection (Erysipelotrix is a genus of bacteria that the pelicans contracted when they raided garbage bags); some took to stealing food from local people. However you look at it, when our provisions allow an increase in a population, the removal of the provision must invariably lead either to a decline in local numbers (population changes) or a change in the animals’ behaviour/diet to compensate. Above, we have looked at the main population change that can come about when food is provided for wildlife by humans: that, all other things equal, numbers increase to a level that cannot be sustained if the food is removed and this leads to increased competition and mortality among animals. This is just part of the story, though, and there are other factors that act at the population level. One, almost universal, finding from studies on the supplemental feeding of wild animals is that it profoundly affects both breeding season and fecundity (i.e. number of offspring produced), increasing both. This is to be expected, given what we have already discussed about food as a limiting factor regulating the carrying capacity of an environment. In a recent paper to the Royal Society’s journal Biology Letters, a team of UK-based biologists reported that supplemental feeding could alter the dynamics of songbird populations by increasing future breeding success. The research team found that birds living on sites with food supplementation during the winter laid eggs earlier and had increased fledging success (i.e. more chicks survived to leave the nest), even when the food was removed six weeks before the breeding season started. Similarly, a study of wild pigs (Sus scrofa sibiricus) and moose (Alces alces) between 1986 and 1998 by Evg Nedzel’skii at Russia’s Irkutsk State Agriculture Academy found more barren (no offspring produced) females of both species in non-supplemented groups than fed ones. Nedzel’skii also observed more embryos and corpora lutea (the clump of cells that forms from an ovarian follicle after the release of a mature egg) as well as higher embryo weights in the provisioned group – the conclusion of the study was that supplemental winter feeding improves the fecundity of wild ungulates. The above are just two examples of a whole plethora of similar studies showing that supplemental feeding increases the length of the breeding season and fecundity in a range of species, including Australian magpies (Gymnorhina tibicen), American red squirrels (Tamiasciurus hudsonicus), red foxes (Vulpes vulpes) and mule deer (Odocoileus hemionus). Food is not always the factor limiting a population, however, and if food is plentiful but, say, shelter from the elements is lacking, the population may not increase. We know, for example, that in populations that cycle periodically such as snowshoe hares and voles, the supplemental feeding doesn’t stop the population crash, suggesting there are other factors at play. In some cases, the effects of supplemental feeding may also be more subtle. In a paper to the Journal of Animal Ecology during 1992, University of British Columbia zoologists Mark O’Donoghue and Charles Krebs reported the results of their study on how supplemental feeding influenced the reproduction and leveret (young hare) growth of snowshoe hares (Lepus americanus) in the south-west Yukon. The zoologists found that food addition increased the number of hares on the survey grids, brought the breeding season forward by one week and led to 5% more females falling pregnant than on the control (un-fed) grids. The study didn’t, however, record any significant increase in litter sizes, length of the male breeding season, leveret growth rates or the total number of leverets born. Moreover, it appears that the higher densities on supplemented grids may have caused the hares stress, perhaps accounting for the higher rate of stillborn leverets. So, supplemental feeding may not lead to a ‘baby boom’, but instead make any offspring that are born more likely to survive. One final element of supplemental feeding's impact on reproduction ties into the reduced movement we shall touch upon shortly. For several years now there have been concerns that if supplemental feeding causes animals to range over shorter areas it may also increase the likelihood of them breeding with relatives - that is, it might increase inbreeding. As far as I know, we don't yet have any data to confirm this in wild mammals, but genetic studies of waterfowl supplied with supplemental food does suggest a higher level of inbreeding compared to control populations. In other words, we lack any science to suggest that providing supplemental food harms animals. Nonetheless, the intimation has long been that feeding animals what might be labelled ‘junk food’ (that high in salt, sugar and saturated fat) is unlikely to be good for them. Most nutritional data we have comes from animals in captivity, but there is some evidence to suggest that the livers of some Great Barrier reef fish fed by tourists are fattier than those fish that don’t receive supplemental food, and an autopsy of urban foxes recently found higher fat depositions relative to rural animals, suggesting urban life was unhealthier. A significant issue with feeding wild animals food that may be unhealthy for them is that, unlike our pets, we don’t constantly monitor them to see if they get sick. If you feed your local fox chocolate, for example, it may take a couple of hours for the effects of the theobromine to manifest, by which time the animal could have left your garden. Feeding the wrong types of food can have other implications, too. Magpies have been known to suffer serious bacterial infection of their beak when fed tinned meat (the meat sticks to the edge of the beak and mouth, leading to bacterial proliferation) – in rare cases this has apparently even lead to the birds losing their beak. Similarly, foods that give humans high cholesterol seem also to give birds (and probably mammals) high cholesterol too. Bread is commonly fed to wildlife, but provides virtually no nutriment; if the stomach is full of such nutritionally-poor items it can reduce an animal’s ability to feed normally, impacting its growth and development. Some products that are widely sold as wildlife food can lead to serious problems if provided ad libitum. 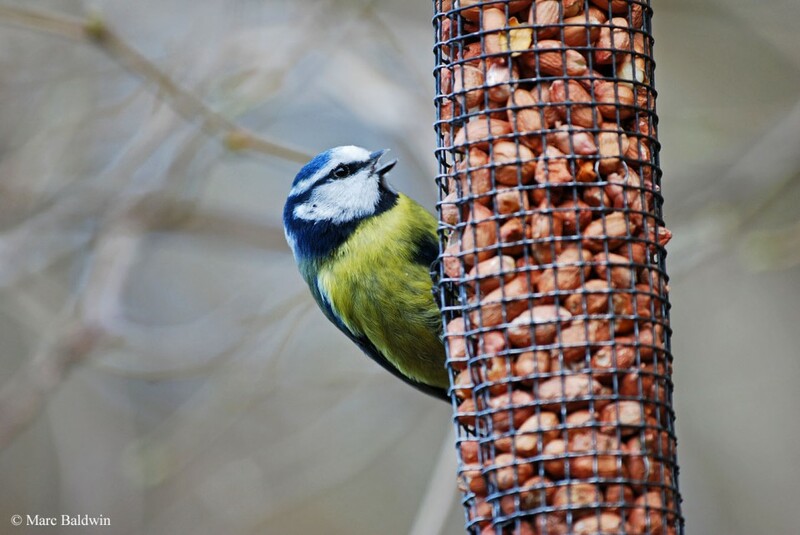 Peanuts and mealworms, for example, are provided in thousands of bird feeders and widely offered to mammal species across the country. Both of these have a high calcium-to-phosphorous ratio, which can impede calcium absorption in the stomach and lead to metabolic bone disorders and osteoarthritis if eaten in quantity. In other words, too many mealworms and peanuts can lead to bone-thinning. Peanuts that are to be offered to birds should also be certified as “wild bird grade” nuts, which means they’re free of the Aspergillus fungus that produce aflatoxins, which can cause liver disease in many bird species. Ideally, peanuts should be offered either in an appropriate feeder or crushed, as many rescue centres suggest that whole peanuts can choke chicks if brought back as food and get stuck on the teeth of hedgehogs, promoting tooth decay and hampering feeding. I have come across no evidence that parent birds bring whole peanuts back to their chicks, but it seems wise to err on the side of caution. In some cases, where inappropriate food is provided animals may actively seek out specific wild foods to counteract some of the nutritional problems. In a paper to the journal Wildlife Biology during 2000, for example, Craig Shuttleworth presented data from his study on the red squirrels (Sciurus vulgaris) on the 40 hectare (almost 100 acres) National Trust reserve at Formby, West Lancashire between May 1994 and July 1996. Shuttleworth found that when the wild supply of conifer seeds ran low, more than half a squirrel’s diet could consist of peanuts provided by visitors to the site or by residents of nearby houses in their gardens. Peanuts have a high fat content (almost half of their dry weight), contain enzymes that prevent amino acids being absorbed and, as I’ve mentioned, have a high phosphorous content. Phosphorous plays an important part in the formation of bones and teeth and in a host of biochemical processes within animal cells. Shuttleworth observed that when peanuts were eaten, so too was an increasing amount of “low energy” foods such as conifer buds – these buds are rich in calcium and the author suggests that the squirrels may eat them to compensate for the high phosphorous in the peanuts and help restore their calcium-to-phosphorous ratio. Pathogens spread more rapidly through a population where individuals are packed closely together than in populations where the animals are more sparsely distributed. This makes sense when we think about it. The more crowded an area, the shorter the distance germs must move to reach the next potential host. Most of us know that if one person gets a cold in the office, it’s not long before lots more come down with it. This is especially pronounced when individuals are stressed. For some time now we have known that stress has an influence on our immune system: while short-term stressors can stimulate our immune system, chronic long-term stressors (such as a shortage or food) can have a detrimental impact. Recently, it was demonstrated that chronic stress reduces the immune system’s capacity to respond to glucocorticoid hormones, which hampers the inflammatory process after an injury. An increased rate of disease spread through a population is one thing, but many animals are also known hosts for pathogens and parasites that can be transferred to humans – so called ‘zoonotic’ diseases. Anthrax, for example, is an important zoonotic pathogen of humans, which is commonly contracted by ruminants (both wild and domestic) who consume the bacterial spores while grazing. Similarly, diseases can also be spread interspecifically (i.e. between species). Perhaps the most topical example of this currently in the UK is bovine tuberculosis, which can be transferred from cow-to-cow and between cattle and (among other species) badgers. Consequently, any activity that serves to concentrate individuals, either drawing them to a point source of food or increasing population densities, has the potential to promote disease spread. It is widely considered that feeding stations are an excellent reservoir for pathogens. In the struggle to get a handle on how squirrelpox virus is transferred, the use of feeding stations has been implicated as a potential infection route (although empirical data are lacking). Feeding stations must be kept clean (i.e. disinfected regularly) and any un-eaten food should be removed. It is almost impossible to put out food so that only one species can access it. When you hang up bird feeders in the garden you get the birds you want and those that you perhaps don’t, feral pigeons and magpies for example. At the same time, food falling to the ground (especially from seed feeders) may attract rodents, which many people do not wish to encourage. Leaving food out for badgers or hedgehogs will probably also attract foxes, which many people dislike. If you’re happy with pigeons, magpies, rodents or foxes visiting your garden then, for you, feeding wildlife probably doesn’t come with any disadvantages unless any of they cause damage. It’s always worth bearing in mind, however, that not everyone finds all wildlife as endearing as you may – foxes may be fine in your garden, but your neighbour may not appreciate it when food put out in your garden is buried in their prize rose beds. Non-target species come in many forms and another aspect to consider when you encourage wildlife in your garden is that some will invariably be predators – where prey is concentrated, predators are attracted. I have come across many comments from avid bird feeders that the smaller songbirds congregating in their garden attracts the attention of owls and sparrowhawks. Additionally, in a 2008 paper to the Journal of Wildlife Management a team of biologists at the University of Wisconsin report that on their study sites in Georgia, where supplemental food was being provided for quail (Colinus virginianus), red-tailed hawks (Buteo jamaicensis) were found much closer to sites offering supplemental feeding sites than to control sites. The suggestion was that the quail were attracted to the provisioned food and the hawks were attracted to the quail. Direct predation on the animals attracted to a feeder can be compounded by the more general potential increase in predation because of having the predator in the neighbourhood. In a paper to the Wildlife Society Bulletin during 2000, Susan Cooper and Tim Ginnett at the Texas A&M University reported the findings of their study on the impact of providing deer feeders on the rates of bird nest predation at a ranch in Uvalde County, Texas between 1997 and 1999. The biologists found that when the ground cover was low (in very dry years), lots of their artificial nests were raided by predators and the lack of cover outweighed any influence that the deer feeders had. When the ground cover was sufficient to obscure nests from view, however, the presence of the deer feeders significantly reduced the number of eggs surviving. The researchers considered that the deer feeders attracted predators, which now in the vicinity, could find the nests. These data contradict previous studies, which have suggested that providing predators with supplemental food may actually reduce the number of nests raided. Several authors have noted, nonetheless, that supplemental feeding of predators is likely to lead to increased nutritional status (i.e. the predators are in better condition) and therefore potentially have greater survival and fecundity, resulting in more predators in the area. It perhaps goes without saying that feeding some predators in your garden (e.g. foxes, ferrets, mink, etc.) may put local inadequately-secured livestock (namely chickens) or pets (rabbits, guinea pigs etc.) at risk. In some areas the risk may be even greater. In the UK there are no longer any large carnivores roaming our countryside that might also be attracted to food left out for smaller predators. In the USA, by contrast, attraction of large predators can be a considerable problem. According to the Humane Society, during 1998 black bears broke into 1,100 vehicles in California’s Yosemite National Park causing $630,000 (£322,000 or €405,000) worth of damage. Similarly, on their website, the Colorado Division of Wildlife note how residents putting food out for foxes and deer attracted a mountain lion that had to be trapped and killed, apparently at the residents’ request, in order to make the neighbourhood ‘safe’ again. High population densities may also result in increased fighting. In some species, deer in particular, there is evidence that gathering at food sources in abnormally high numbers leads to increased aggression and competition between individuals. Such intensive competition may result in younger and weaker individuals being excluded from the food. Provisioned animals may also be more aggressive towards people as a result of the feeding. Several studies on primates, including one on macaques in Gibraltar and Thailand and one on baboons in Tanzania, have found that groups provided with food by humans tended to be more aggressive towards people. In the Thailand study, the macaques weren’t only more aggressive to people but also less healthy and less active than the control group that weren’t given food by humans. We have mentioned that not everyone is equally as appreciative of wildlife. I personally enjoy watching squirrels digging in the flowerbeds outside our window and tackling the bird feeders in my parents’ garden. I also know of several people who actively discourage, even shoot, squirrels that come into their garden. In an urban setting, the home range or territory of an animal is likely to be less (sometimes substantially so) than it would be in a more rural setting because resources tend to be higher. As such, if a squirrel, fox or other animal visits your garden it is not unreasonable to think that it will also visit your neighbours’ gardens and may live fairly close by. The guy four doors down from you may not take kindly to foxes raising a litter or cubs under his shed and, justifiably or not, may blame your feeding station. Animals such as foxes, squirrels, rats and mice may also cause damage to the property, especially if they take up residence in or under the house. There is some suggestion that where nuisance leads to persecution, animals may actually stay away, regardless of food put out for them; moreover, this might be an inherited trait. In a 1994 paper to the Wildlife Society Bulletin, a team from the Michigan Technological University studied the response of grey wolves (Canis lupus) to the roads and human presence at the borders of the Kenai National Wildlife Refuge in Alaska. The researchers found that wolves avoided areas of heavy human traffic and suggested that wolves may teach their young to avoid areas that they associate with persecution. Brown bears have also been observed to shift their territories away from heavily-used highways and badgers in heavily persecuted areas show different emergence times to those subject to less persecution. Some wildlife biologists have raised concerns that animals moving to and from feeding stations might be in greater danger of being killed than those foraging for wild food. Between 1993 and 1996 Craig Shuttleworth studied the population dynamics of red squirrels (Sciurus vulgaris) in and around the National Trust reserve at Formby in Lancashire. In a paper to the journal Urban Ecosystems, Shuttleworth presented his results for the relationship between traffic mortality (i.e. the number of squirrels being run over) and the provision of supplemental food. Shuttleworth found that, in the presence of supplemental food (namely peanuts) the squirrels spent about half their time foraging on the ground – previous studies have found that the time spent on the ground by squirrels wholly reliant on wild food was only 10% to 30%. The suggestion is that the greater period of time spent on the ground increase the potential danger from predators. Furthermore, in some situations squirrels receiving hand-outs cache (bury for later use) five-times the number of items than those relying on wild food alone, suggesting there may be a greater risk associated with being run over as they move from the reserve to, from and between gardens. From the data presented by Shuttleworth, there was no statistically significant correlation between the number of squirrels killed and the time they spent on the ground; but the highest road kill reported was during 1994, when animals spent the most their time on the ground (cf. the following autumn when only 37% of activity was on the ground). On their website, the Humane Society of the US point out that, in their experience, beggar animals in the Rocky Mountains tend to stay close to roads, where the risk of traffic collision is greater. In addition, where large predators, such as bears, develop the habit of breaking into cars or houses while searching for food the potential for being shot is dramatically increased. Food is a very potent reinforcer, that is it encourages a particular behaviour, and is widely used in the conditioning of animals, including humans. Have you ever given your kid(s) (or, as a child been given) sweets for being good or brave? 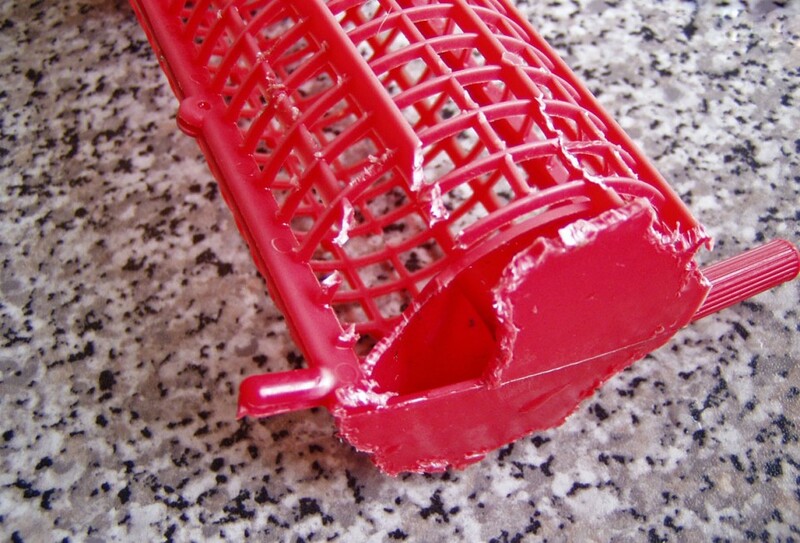 How about dog training – have you noticed that food is almost always used to reward the dog when it does as it’s asked? These are all examples of operant conditioning using positive reinforcement; the animal is being trained to associate doing something (sitting on command or not making a scene in the supermarket) with getting something to eat. Why is food so effective? It’s effective because it is a limiting factor: animals need it to survive. Having set the scene, we will return to this topic shortly, when considering the possible implications of teaching animals to associate humans with food. In other words, the animal starts to ignore whatever had previously caused it to respond. In our old flat, the back garden bordered a railway line and when we first moved in the train activity used to keep me awake at night. After a couple of weeks I was sleeping soundly, barely noticing the trains coming and going; I had become habituated to their presence. Animals too can become habituated to human presence – if you feed a fox for a few consecutive nights you will find that it will tolerate you moving a little closer. In most cases the animal will maintain a healthy distance from you (this is called the animal’s “flight zone”, beyond which it feels confident it could out-run you should the need arise), but I have seen some examples where foxes have become so habituated that they feed from the person’s hand. Contrary to popular misconception, this habituation doesn’t make the fox any more dangerous, but can make it more of a nuisance. There has long been concern that provisioning animals with food teaches them to associate humans with something to eat; this occurs through operant conditioning as the animal learns that if it performs a particular behaviour (i.e. comes to a certain place at a certain time) it gets food. The concern is that the process may go a little further and teach the animal to associate people in general with a free meal. The science is mixed on this and it appears to be the case for some species (many birds, for example), while there is no evidence to support such a contention in others (foxes, for example). Conservationists have taken this one step further suggesting that animals may even associate human-made inanimate objects with food outside of the scenario where they actually learnt the original association. Surfboards are one thing, but conservationists were also alarmed by reports that some operators were putting children’s toys into the water to encourage the sharks to investigate further and some “… gun their engines to ‘call in their babies’ upon arrival at dive sites.” All in all, the White Shark Research Institute’s Craig Ferreira told New Scientist: “Guaranteed there will be a death or bad injury”. 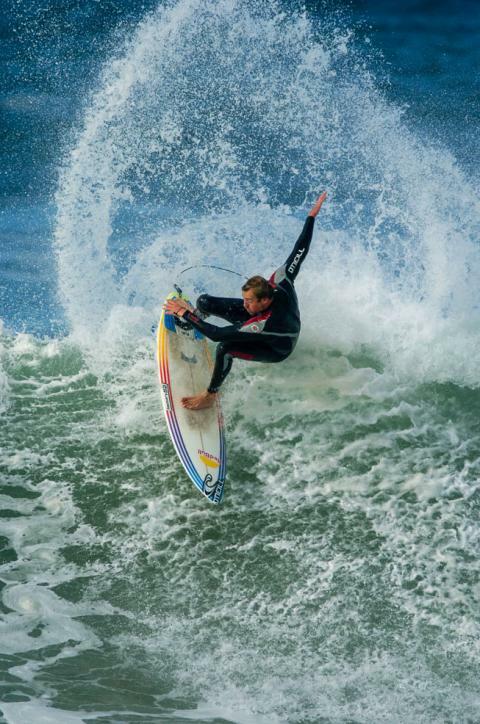 So, the idea is that a great white used to visiting a tour dive site may be swimming along one afternoon and spot a surfer sitting on his/her board waiting for a wave; having been taught to associate the shape of the board with being fed, the shark might go to investigate. If ever proven, this would be operant conditioning: the shark performs a voluntary behaviour (going to investigate), which may result in getting something to eat (i.e. reinforcement). In the case of sharks, the suggestion that they may learn to associate humans with being fed doesn’t stop with Carcharodon: in the tropics, there has been much debate recently about whether shark dives (where tourists pay to dive and watch reef sharks being fed) should be allowed to continue. In August 2001 a holidaying Wall Street banker lost a leg in a shark attack when he was attacked by a shark off a beach in Grand Bahama – he successfully sued the beach resort for failing to notify guests that local dive operators run shark feeding dives just along the coast. Later that year, in November, the Florida Fish and Wildlife Conservation Commission voted 6 to 1 in favour of banning shark feeding dives in their waters – the ban was challenged by some dive organizations (including PADI and DEMA), but they failed to have it lifted. So, is there any evidence that feeding sharks (or any other animal for that matter) teaches them to associate humans in general with food providers? The short answer is yes, for some species at least. In some populations, repeated interaction with humans and reinforcement with food has altered their response to humans. You can take your lunch and sit in a park in almost any city on the UK and within minutes you’ll draw the attention of birds and squirrels – some will even sit on the bench next to you waiting for a hand out. Similarly, in parks where Canada geese (Branta canadensis) are regularly fed by humans, whole flocks waddle directly towards people in search of hand-outs. There is concern that being less afraid of humans makes them more dangerous (for which there is currently very little evidence), but also that it makes them an easier target for those less endeared to wildlife: namely hunters and those with BB guns and too much free time on their hands. Indeed, habituation to wildlife can also lead us to take more risks. With few exceptions, humans are notoriously bad at judging the ‘mood’ and flight zone of animals, and getting too close can often result in problems, especially if the animal is already habituated to human presence and doesn’t run away. The results of such close encounters can be serious and there have been many cases of people being bitten, scratched or pecked by wildlife that they have gotten too close to. 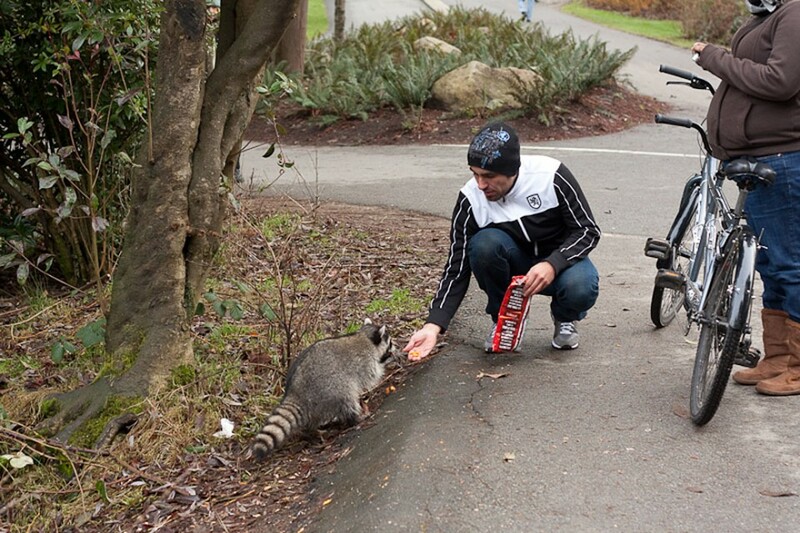 Perhaps one of the largest risks people take is hand-feeding wild animals. In his article to the Coastal Conservancy (California) website, California Fish and Game wildlife biologist Ron Jurek writes of an incident where a woman was hospitalized with a broken coccyx after being tossed in the air by a deer buck she was feeding apple slices. Worse, as Jurek notes, is that each time a human is injured by a wild animal, there is often an outcry for the animal to be killed because it’s considered dangerous. Furthermore, there is increasing evidence that animals can generalise well. For example, my girlfriend and I regularly visit a wildlife sanctuary in the New Forest, Hampshire. In one enclosure people used to be allowed in with a couple of fallow deer (Dama dama). The sign on the gate asked that visitors didn’t allow the deer to eat their guide books and as soon as we were spotted a deer came straight over and pushed up against us looking for food. (I assume it was food she was looking for because, when she failed to find any, she began chewing on my girlfriend’s cardigan and my t-shirt.) After repeatedly being pushed away, the doe eventually got the message and moved on to another couple in the enclosure. The deer could obviously recognise us as the same ‘kind’ of animals that bring them food every day, despite the different size, shapes and colours of the people visiting the enclosure and the fact that none of us were wearing the park’s uniform or pushing a wheelbarrow, which is how the food is brought into the enclosure. Another issue proposed as a result of habituation of wildlife through feeding is animals may fail to respond appropriately to predators. This was one of the concerns raised about hedgehogs becoming too familiar with humans while being rehabilitated. During their tracking studies, Pat Morris and his team found that some animals became so used to being caught and weighed every night that they barely even bothered to curl up. Some of Morris’ critics suggested that this might have made them less likely to curl up when confronted by a badger. I’m not aware, and neither was Morris, of any data to suggest that a habituation to humans makes animals any less able to respond appropriately to any other predatory species. Experience certainly suggests that animals can make the distinction between ‘friend’ and ‘foe’. After all, the songbirds in our garden will readily go about their business while we sit out there or photograph them, but as soon as they sense a sparrowhawk (Accipiter nisus) in the vicinity they go quiet and retreat to their perches. Habituation to humans may not change an animal’s response to a different predator, it may cause it to put itself in greater danger than if it retained its ‘natural fear’ of man. Where I used to live in West Sussex, our neighbour fed a starling (Sturnus vulgaris) every morning in her garden. Over the years the bird became very tame; so tame that it would allow her to pick it up. On more than one occasion the starling came into our house and sat on the furniture looking at us. While this was rather charming to begin with, at the time my parents had three cats, any one of which would not have passed up the opportunity to catching the bird. I dare say that, had the cat arrived, the bird’s response would have been to fly away (as would be expected of any ‘non-habituated’ individual); however, by entering the house it had inadvertently put itself in greater danger. Of course, perhaps I overestimated the danger; perhaps the bird was actually safer inside the house (despite being in an enclosed space). While outside the starling would be vulnerable to cats and other predators (e.g. birds of prey); in the house it was only vulnerable to the cats, which were perhaps more likely to be in ‘sleep mode’ than ‘hunting mode’. Nonetheless, I can’t help but feel that such ‘taming’ of wild animals does them few favours in the long run. We have seen how food represents an important limiting factor in the control of populations, but it is also intrinsically liked to another limiting factor: available home range. The area of land (or water) that a territorial animal uses is directly related to the amount of food available in the habitat. Red foxes in our towns and cities (where food is abundant), for example, maintain a territory as small as 40 hectares (0.39 sq-km or 0.15 sq-mi. ), while those in the highlands of Scotland (where food is considerably scarcer) may range over as much as 4,000 hectares (40 sq-km or 15.5 sq-mi.). When a team of biologists at Bristol University studied the impact of supplemental feeding on the city’s fox population they found that when food was put out it was usually done so in quantities that far exceeded the amount required to support the local population. Moreover, the biologists observed that as a result of increased food availability, the foxes reduced the size of their territories – in one case so much food was available that the dominant pair confined their activity to half their original territory and the slack was taken up by their daughters. The combination of excess food and territory splitting led to the population reaching a high of 30 adults per square kilometre (75 per sq-mi. ), the highest fox density ever recorded. The scientists also noted that where food was super-abundant, the foxes didn’t move very far and localized problems with foxes digging and defecating in gardens was reported by householders. Given that food availability seems to the most important factor determining the activity budget of an animal (i.e. how it spends its time), it follows that where supplemental food is provided, animals need to spend less time foraging and hunting or on other activities that may take them further afield. The impact of supplemental feeding on home range use has also been studied in the Canadian red squirrels, Tamiasciurus hudsonicus, by biologists at the University of British Columbia. Between June 1983 and June 1986, Thomas Sullivan studied the influence of supplemental feeding stations on red squirrel populations and found that the average abundance of animals in the fed populations was three to four times higher than in the (non-fed) control. Sullivan reported, in his 1990 paper to the Journal of Mammalogy, that more adults were recruited into the fed population, which had longer breeding seasons than the control. In a response to Sullivan’s findings, however, Rolf Koford of the US Fish and Wildlife Service suggested that the increase in squirrels recorded could actually be a result of individuals increasing their movements; effectively shifting their home ranges to get piece of the action – this has been demonstrated in grey squirrels (Sciurus carolinensis). Nonetheless, in their response Sullivan and Walt Klenner maintain that even when the transient squirrels (i.e. those that were only caught once) were removed from the analysis, there was still a three or four-fold increase in density and their other studies had demonstrated a close relationship between the capture frequency and the territorial status of the squirrels. So, some species may decrease the territory they defend in the presence of supplemental food, while others (namely Sullivan’s red squirrels) seemed to actively defend feeding sites from intruders. This tells us that different species respond to supplemental feeding in different ways and it’s not always easy, or even appropriate, to assume a particular response – the fact that supplemental feeders attract red squirrels from miles and lead to a population increase doesn’t mean the same is true for other squirrel species. Adjustment of home ranges and territories is one aspect of supplemental feeding, but it can also have deeper influences – influences on migration. We have already mentioned the case of pelicans failing to migrate after tourists brought fish to feed them on. There are many more examples, especially from birds, of supplemental feeding altering migration timing or preventing it altogether. For example, according to the American wildlife charity Progressive Animal Welfare Society (PAWS), there have been significant problems with Canada geese in Washington because human food sources are so plentiful that many no longer migrate; instead they remain onsite and the population increases to the point where the birds are culled by the local authorities. Why should animals fail to migrate when supplemental food is provided for them by humans? Migration is a complicated phenomenon but for our purposes we’ll think of it as the movement of predators outside of their home ranges to follow prey. This may sound a little odd to begin with; but in its broadest sense predation is the process whereby one organism feeds on another, meaning that herbivores are considered predators of plants. So, when a herd of wildebeest, for example, move elsewhere looking for new prey (grass) they are migrating. If lions, one of their main predators, follow them, the lions would also be migratory. The crux of our definition is that an organism is following its food and, with this in mind, we can see how supplemental feeding has the potential to significantly alter migration. If the food doesn’t move, or is substituted with something else, there’s no longer any need to embark on the often perilous journey looking for it. PAWS have expressed concerns that supplemental feeding may affect animals’ ability to decipher seasons because migration is often thought to be triggered by a seasonal decline in the availability of food; the jury is still out on this. One final concern raised by conservation groups is that if animals fail to migrate, their old summer or winter stomping grounds may be developed by humans. For example, one of the many proposed sites for development in the UK is the Bristol Channel, where an energy company wants to erect 380 wind turbines to form the ‘Atlantic Array’. The plan is being challenged because the channel is an important feeding and breeding site for several species of migratory birds. One species in particular, the critically endangered (IUCN Red List, 2008) Balearic shearwater (Puffinus mauretanicus), migrates from breeding sites in Spain to feed in the estuary during the summer. If these birds failed to migrate they could not be used as an argument for conservation of the region. Having read this far, you may be left with the feeling that there is a rather overwhelming case for you to remove that bird feeder or to stop putting out food for your local foxes, badgers, hedgehogs etc. However, an animal’s behaviour continually changes, adapting to the environment in which the individual finds itself. In settings where an animal is already significantly influenced by human activity, such as in our towns and cities, accepting food that you’ve put out in your garden may simply be swapping one human-derived food source for another. At the start of this article we established that there were a couple of reasons people had for feeding wildlife; one was that they believed it helped the animals out by improving their chances of survival. We know that providing extra food affects different species, indeed different populations, differently in terms of whether it increases survivorship. For those wishing to put food out for their local wildlife, the important message seems to be that, while appropriate supplemental feeding doesn’t always seem to improve survival probability, nor does it seem to decrease it. Nonetheless, if food is put out and then removed, the evidence suggests that, everything else equal, the population will decline to the pre-provisioned level (the carrying capacity). How much of the decline is a result of death and how much of emigration isn’t known for certain, but the possibility that the decline is largely a result of starvation is sufficient for many opponents of feeding wildlife to argue people shouldn’t put out food. If the provisions need to be removed and the food is declined gradually, however, the impact (in terms of mortality) can probably be minimized. So, you really want to feed wildlife in your garden. Is there a better way to go about it than putting the remains of your Sunday lunch out on the lawn? Well, yes, and the answer is probably in how you manage your garden. Arguably, whether you garden in a manner that increases natural prey or provide a plate of mealworms, you’re still providing supplemental food for the animal(s) of your affection. I see a crucial difference here, however. Not only are you providing the crucially appropriate food, the stuff that the birds and mammals have evolved to hunt and forage for, but you’re also providing some of the habitat that is disappearing rapidly elsewhere. Bramble bushes, trees, shrubs, hedges, flowers, lawns, log piles etc. attract invertebrates, which in turn attract their predators (birds, small mammals, reptiles and amphibians). Small mammals and birds attract bigger (predatory) mammals and birds. The greater the variety of ‘habitat types’ you can provide the better and, if you can avoid using the pesticides that are likely to be counterproductive to your goal, so much the better. Better still is if you can install a pond, which will serve as a highly-prized water source for all animals. If you plan to put food out for your local wildlife, it is best to leave out food that would form part of their natural diet. For example, if you plan to feed your local foxes, put out meats (chicken, steak etc. ), eggs, insects (perhaps mealworms or insect mix sold by pet shops for reptile owners), fruits, nuts and so on. Avoid foods like bread and milk (hedgehogs will eat it, but it’s not good for them), chocolate (see QA) and highly processed foods such as sausages, spam and crisps. If possible leave out a bowl of clean water. In his book Urban Wildlife, Wildlife Trust Director of Community Affairs Peter Shirley suggests mixing up your bird feeders. Along with advocating the growing of native flowers, shrubs and trees to encourage insects and other creepy-crawlies, Shirley recommends using several places to feed the birds rather than just one – this way it spreads them out, making it more difficult for predators (including the local cats) to nab them and gives the less aggressive birds a chance at the feeder. Shirley also suggests offering food in different ways; using hanging feeders, tables, ground-based feeders and pushing nuts and other treats into the bark of trees to stimulate natural foraging behaviour. Several years ago, Mike Towler designed a squirrel-proof bird feeder, the plans for which can downloaded below. The final point to consider when feeding wildlife is the local laws. To the best of my knowledge—outside of nature reserves, zoos and wildlife parks—there are no laws forbidding the feeding of wildlife here in the UK, although feeding some ‘pest’ species is discouraged in many large cities. This is not the case elsewhere in the world, however. It is illegal to feed wildlife in Northern Australia, for example, as it is in many American states – Monterey County, Ventura County, and Northwest Minnesota to name a few. Some areas have specific no-feeding laws. For example, in Alaskan wildlife parks it is illegal to feed any animal except a songbird, which have declined significantly in recent years, while in Arizona it is currently illegal to feed any animal that isn’t a songbird or tree squirrel. Similarly, it is illegal to feed deer in Virginia and to feed alligators in Georgia. So, the advice here has to be to check before you feed! So, where does all of the above leave us in respect to whether we should, or shouldn’t, feed wildlife? The general opinion of wildlife conservation groups and many government bodies is that supplemental food for anything other than garden birds shouldn’t be provided and there is a evidence, all be some of it rather circumstantial, to support the decision. However, many species are experiencing significant declines that appear to be a consequence of human activity. It is difficult, therefore, to argue that we should not help them out if we can. The key here is that, if supplemental food is to be provided, it should be appropriate food, not highly processed (fatty, sugary and salty) ‘human food’. Feeding stations should be kept clean and any uneaten food should be removed – water should also be available if at all possible. I know a great number of people who will staunchly disagree with me on this, but for the purpose of due diligence I must advise that people who feed their local should observe the animals from a distance and should avoid direct interaction, however tempting it may be. They should also be sympathetic to the concerns of their neighbours and be prepared to come to a compromise in the event of an issue arising. If the food needs to be removed at any time, it should be phased out gradually if possible, rather than being removed in one hit. Ultimately, all of this comes down to doing what’s best for the wildlife in your area. In some cases, feeding wildlife can cause more problems than it solves. It is up to the individual to take a responsible approach to the matter, weigh up the pros and cons and make an informed decision on how to proceed.